The Sordid History of British Manipulation of American Democracy Series: Read it and weep! "The Safari Club set a precedent and some guidelines for the subsequent CIA operation in Afghanistan. 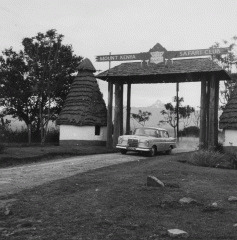 As its name implied, the Safari Club's main task was to carry out missions -- always anti-Communist ones, for America, on the 'good guys' side of the Cold War""
The Safari club represented the true essence of what CIA Director Allen Dulles had intended when setting up the Central Intelligence Agency following World War II; an autonomous covert action organization with global reach, beyond the jurisdiction of American democracy and responsible to no one. A spinoff of the right-wing Pinay Cercle as a secret off-the books "Private Sector Intelligence agency," and in league with the CIA and Brian Crozier's 6th International, the Safari Club was only formerly acknowledged in 2002 by the one-time head of Saudi Arabian Intelligence Prince Turki Al-Faisal to have come into existence in 1976. But as revealed by John K. Cooley in his groundbreaking 1999 study, Unholy Wars: Afghanistan, America and International Terrorism, the Safari Club members had been active informally for yearssecretly protecting CIA assets and covert operations from the prying eyes of Congressional investigators following Watergate and the revelations of the Church Committee hearings on 30 years of CIA coups, cover-ups and assassinations. Cooley writes, "The Carter team adopted a method of avoiding the stigma of direct CIA involvement in covert operations which could go wrong and backfire on the United States. It was a method which Henry Kissinger" had refined and applied with skill: get others to do what you want done" the 'others' in Kissinger's era of the early 1970s, a time of rehearsal for the approaching adventure in Afghanistan, were a set of unlikely colleagues""
Kissinger's set of unlikely Safari Club colleagues included, France's Count Alexandre de Marenches chief of French external intelligence, The Shah of Iran, King Hassan II of Morocco, President Anwar al-Sadat of Egypt and Kamal Adham, head of intelligence for Saudi Arabian King Faisal. More to the point, the Safari Club was more than just an off-the-books spy operation doing covert operations for the CIA whose methods the Carter team adopted. The Safari Club was the real CIA, covertly funded by Saudi Arabia and run out of the U.S. embassy in Tehran by the CIA's former director Richard Helms, U.S. Ambassador to Iran from 1973-1977. As presented by one-time CNN Special Assignment investigator Joe Trento in his 2005 expose' Prelude To Terror , "Both Prince Turki and Sheikh Kamal Adham[head of Saudi intelligence] would play enormous roles in servicing a spy network to replace the official CIA while it was under Congressional scrutiny between the time of Watergate and the end of the Carter administration" Several top U.S. military and intelligence officials directed the operations from positions they held overseas, notably former CIA Director Richard Helms, at this time Ambassador to Iran." According to Trento, at this time, Sheikh Kamal Adham took control of intelligence financing for the United States by setting up a network of banks with the official blessing of the CIA's George Bush; turning "a small Pakistani merchant bank, the Bank of Commerce and Credit International (BCCI), into a worldwide money-laundering machine, buying banks around the world in order to create the biggest clandestine money network in history." Working alongside the bank's founder Sheikh Agha Hasan Abedi, Adham not only gained "a comprehensive knowledge of U.S. intelligence operations," but expanded the very concept by using BCCI to merge the Safari Club's objectives with "every major terrorist, rebel, and underground organization in the world." A 2001 Time magazine report found that the bank functioned as "a vast, stateless, multinational corporation that deploys its own intelligence agency, complete with paramilitary wing and enforcement units, known collectively as the "black network:'" a black network that would threaten, bribe or assassinate anyone it needed to turn Afghanistan into the place to trap the Soviet Union in their own Vietnam. Trento writes, "Adham did not rely simply on money to carry out the plan. Adham and Abedi understood they would need muscle. They tapped into the CIA's stockpile of misfits and malcontents to help man a 1,500-strong group of assassins and enforcers." To most of Washington, the bloodless 1973palace coup of the Afghan King Zahir Shah by his cousin and former Prime Minister Mohammed Daoud along with a faction of the Afghan left was a non-event. But to the Safari Club's Shah of Iran, Daoud's coup signaled a leftward drift and provided the opportunity to demonstrate his influence as America's policeman in the Gulf. Considered to be too friendly to Moscow (which had earned him the nickname the Red Prince), Daoud was known primarily for his repeated claims to Afghan (ethnic Pashtun) provinces seized by the British during the 19thcentury in (what is today) Pakistan. Due mainly to America's lack of interest in the country, the U.S. State Department viewed Daoud mostly as an Afghan nationalist and a nuisance. Afghanistan rated at the bottom of U.S. foreign policy priorities and had since the end of the British Raj in 1947, been cast into the Soviet's sphere of influence. But as president, Daoud planned to break the mold and needed the West's economic assistance to do it. He had come to the newly oil-rich Shah of Iran for help but found himself at the mercy of the notorious Safari Club and the Shah's secret police, SAVAK. South Asia expert Selig Harrison writes, "On the one hand, Teheran used its aid leverage to press Daoud for the removal of suspected Communists. At the same time, Savak channeled U.S. weapons, communications equipment, and other paramilitary aid to anti-Daoud groups." The Shah's campaign against Daoud quickly drove him to unceremoniously dump the Afghan left, but not before a coalition of CIA-backed agents from Pakistan and Iran had come together to organize his enemies on the left and the right against him. Harrison continues, "Pakistani harassment of Daoud reached its climax in a series of Islamabad-orchestrated raids on police posts in the Pansjer valley. Savak, the CIA and Pakistani agents were also involved in the abortive, fundamentalist-backed coup attempts against Daoud in September and December 1973 and June 1974." One Pakistani-trained group involved in the Pansjer raids were the Setam-i Melli (Against National Oppression), a Tajik-based Shiite/Maoist splinter group broken-away from the Marxist People's Democratic Party of Afghanistan (PDPA ). As pro-Chinese and anti-Pashtun, the Setam and a variety of other Shiite /Maoist groups would find themselves attractive to Chinese intelligence and at odds with both Prince Daoud and the Pashtun dominated PDPA and were driven underground. But as Chinese involvement in Afghanistan grew, they would return in a mysterious role that would spontaneously deliver the pivotal element Zbigniew Brzezinski would need to enact his grand plan. Mohammed Daoud fought off the CIA's initial intrusions from Savak, the CIA's Pakistani agents and their fundamentalist (soon to be) holy warriors. But with Western influence in Southeast Asia closing out in Vietnam in 1975, a new Great Game for Central Asia was about to begin. And without the State Department knowing much about it, President Carter's national security advisor Zbigniew Brzezinski was busy moving the chess pieces into position.